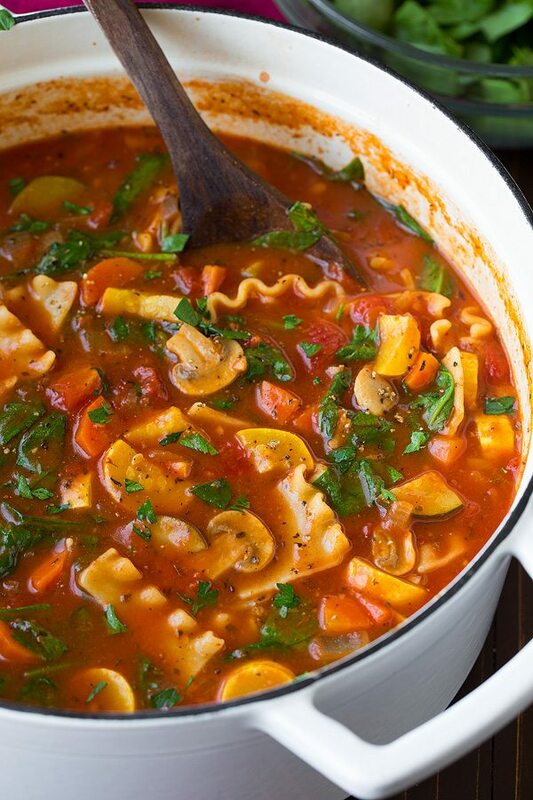 Vegetable Lasagna Soup is so good you won’t even miss the meat! It’s perfectly hearty and totally filling and brimming with tons of fresh vegetables. 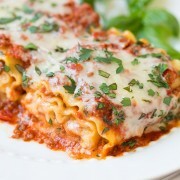 Then it’s finished off with a generous dollop of mixed lasagna cheeses that melt perfectly into the hot soup. The ultimate comfort food! Lasagna + soup, two of the world’s best foods. 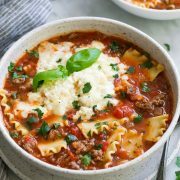 A few years ago I shared a recipe for a beef lasagna soup and for the longest time I’ve been meaning to share a vegetarian version, so finally here it is. Even my meat loving husband loved this soup! And of course I found myself heading back for a second bowl because it is just soooo good! I really like that this is a blend of healthy and indulgent so you get the best of both worlds. You get all the vitamins etc. etc. 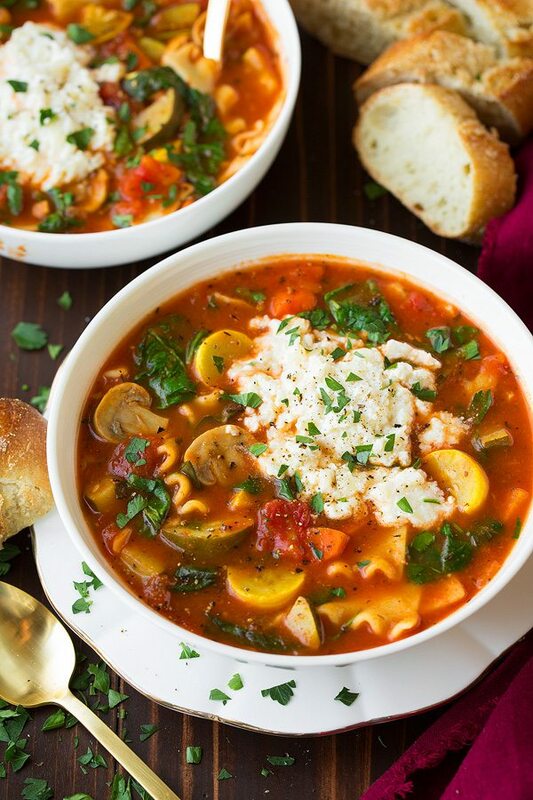 from the veggies and then you get that epic, utterly delicious, melty cheesy goodness that you swirl into your soup and swoon over with each bite. MMMMM I can’t wait for another bowl! And of course what’s a good soup without some bakery fresh crusty bread to go with it. Yes, I’m a carboholic. Too true. After eating this we ended with Pumpkin Cake with Cinnamon Cream Cheese Frosting for dessert. It was justified because of that overload of veggies I consumed with this meal :). 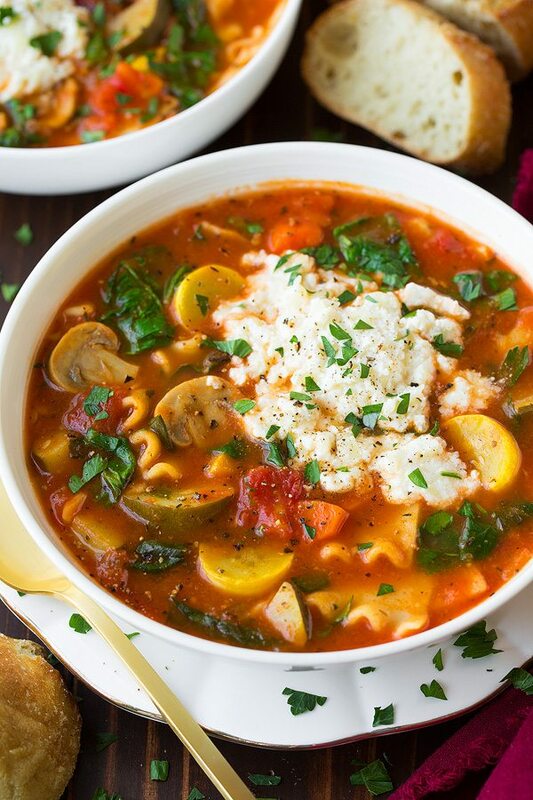 This vegetarian soup is so good you won't even miss the meat! It's perfectly hearty and totally filling and brimming with tons of fresh vegetables. Then it's finished off with a generous dollop of mixed lasagna cheeses that melt perfectly into the hot soup. Add onion and carrot and saute until softened, about 8 minutes. Add garlic and saute 1 minute longer. Add in broth, water, tomatoes and tomato sauce, zucchini, squash, mushrooms, basil, oregano, thyme, rosemary, sugar and season with salt and pepper to taste. Bring to a boil then add pasta (or boil pasta in a separate pot as listed in notes) then reduce heat to medium low. Cover and simmer, stirring occasionally (loosen any noodles that may stick to the bottom when stirring), until pasta is tender, about 10 - 13 minutes. Meanwhile in a mixing bowl stir together mozzarella, parmesan and ricotta while seasoning lightly with salt to taste. Stir spinach into soup and allow to heat through until wilted (it will wilt quickly, about 30 seconds). Serve soup warm topped with spoonfuls of the cheese mixture (just swirl it lightly into your personal serving - it will melt quickly) and sprinkle with parsley if desired. 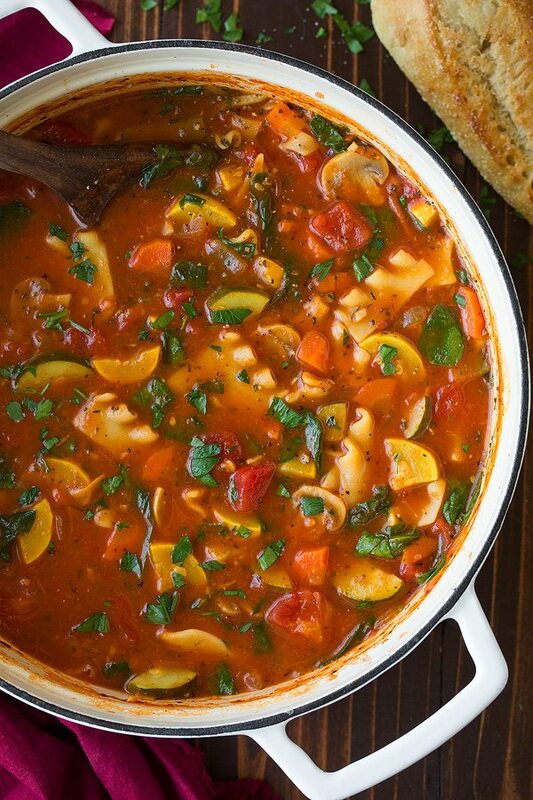 *If you won't be serving all of this soup right away I highly recommend cooking the lasagna noodles separately. Just omit the 1/2 cup of water and 1/2 cup of the broth. Boil the noodles in a separate pot in salted water, then add them to each individual serving. Also, leave the simmer time for the soup the same so the zucchini, squash and mushrooms soften. I recommend doing this because I've made this soup twice and after it's rested for more than 20 minutes it starts to become more like a stew and the noodles just soak up all the liquid and become soggy. It works great to cook the noodles in the soup if you are serving it right away though. 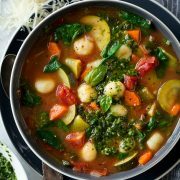 Nadia: I made this soup on Sunday and my husband loved it! I never made a soup before and yesterday was the first time I tried a recipe from your web page. I have to admit that I was nervous making this soup, but it turned out great! Paige: This soup looks incredible! I need it in my life!